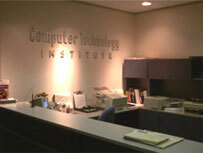 Background: CTI has been delivering traditional computer training since 1989. In 1993, the Computer Technology Institute was created to encompass all of our career, short-term, and corporate training. We continue to develop, modify, and implement courses based on the changing needs of the workplace. We currently serve over 10,000 clients annually and are recognized as industry leaders in training and professional development. Our Commitment: We are dedicated to providing professional, top-quality computer and career training to develop our clients' skills and increase their employment opportunities. Our Staff: Clients comment that the instructors at the Computer Technology Institute are the best to be found. The instructors' experience in industry and in teaching adults helps make our training practical and relevant to today's workplace. The individual support and assistance provided by our customer service representatives and career consultants ensure success and encourage personal growth. Our Facilities: We have training facilities located in Mississauga, Brampton and Toronto. All sites have parking (free of charge at most sites), wheelchair access, and public transportation nearby. Training labs and software are upgraded regularly to ensure that students are using the latest available technology. A computer is available for each client at an ergonomically-designed workstation. We make every effort to accommodate people with special needs. Our Associations: At the Computer Technology Institute, we recognize that certification is the key to our clients and graduates success. That is why we choose to ally ourselves with the organizations and associations that the technology industry demands. For a list of our associations, click here. Flexible Scheduling: Courses are offered mornings, afternoons, full days, evenings, and weekends to meet your needs. Instructor-Led Classes with Low Teacher-to-Client Ratio: A maximum of 16 students attend classes, led by an instructor who uses lecture, demonstration, audiovisual displays and individual assistance to make learning fun and productive. Ongoing Support and Consultation: Instructors, customer service representatives, and career consultants are available to provide ongoing support and assistance to help you achieve your employment goals.